The title is just a joke, although the NYT isn't exactly my go-to when it comes to financial reporting. Anyway, Barry Ritholtz ran the following chart from the NYT today. Which is cool and all, but by my calculations the debt looks quite different. Granted, this data is like 5 weeks old, but the gaps are so large in some cases that something must be wrong because there hasn't been that much activity in sovereign issues/redemptions. I'll pull up the data on Bloomberg some other time and give you an update, but at first glance, there is something deeply wrong with this graph. Either this is not sovereign debt or someone made a mistake. Maybe they are counting bank debt too? I don't know, but comment if you do. Take in mind NYT is reporting the debt in dollars. Considering EURUSD = 1.27 at time of writing, I think someone fucked up. 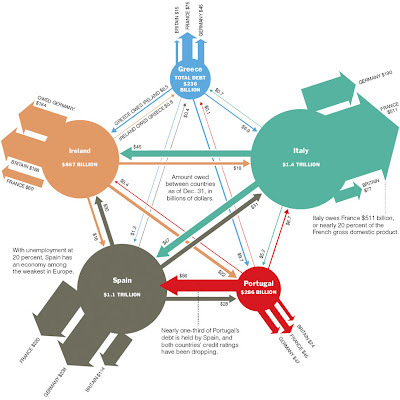 the figures come from this report and are for the end of 2009. the data starts on page 74 and covers all countries (note that the numbers for each european country’s debt-holders are spread across pages 74, 78 and 82). these figures include both government and bank debt. hope that helps! OK, I lied, there is one piece of good news, the weakening Euro reduces the dollar value of these liabilities, so, in that respect, they are overstated. There has definitely been increased borrowing in the part of sovereigns since December 2009, particularly the ones in question which have significant budget deficits. Even the data I posted understates this, since there has been debt placements since then. With widening spreads and downward rating revisions, banks might have to tighten lending to offset changes capital that is marked-to-market. Although, no big deal since all this stuff can be repoed at the ECB. That Ireland number is SCARY. Not a lot of it is sovereign debt, a lot of it is bank debt, but that's too-big-to-save territory for the Irish government. If they face another banking crisis, they're going to need to go outside for help. It's $206,429 of debt per-capita! By the way, this is why I hate it when they convert figures to dollars from their original currency. Liabilities and assets should be listed in the currency they are denominated in. Exchange rates are only valid for a very brief point in time, making the data kind of useless or hard to use once that piece of information changes.